Use to create the scariest Halloween house on the block! Hang over doorway, window, or drape from ceiling. 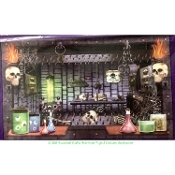 Creepy addition to cemetery, graveyard, dungeon, witches den, scientist lab, mad doctor office, pirate scene, etc.